Martin Tripp also released a list of VINs for cars that he says are equipped with flawed battery modules. 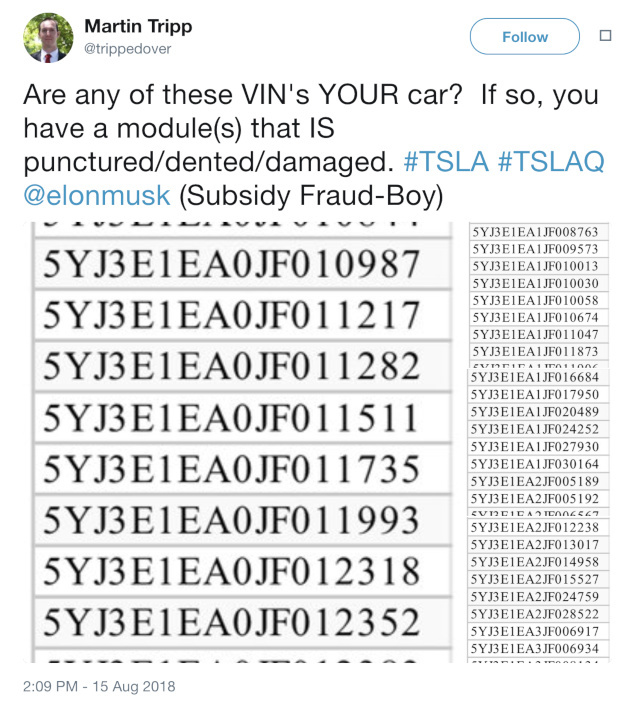 The employee Tesla is suing for theft of proprietary information has tweeted photos and other details, perhaps in an attempt to back up some of the claims he made against the automaker. 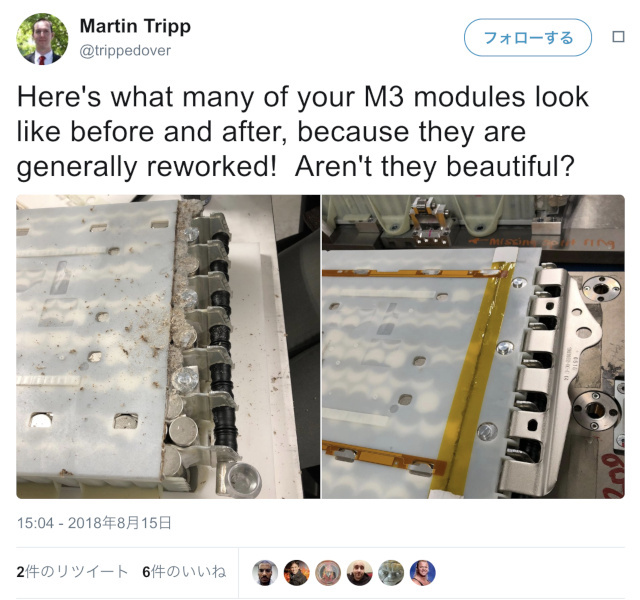 Two of the photos Martin Tripp has tweeted out show what he says is a damaged* battery module used in Model 3 vehicles before and after it was "reworked." Tripp has also released a lengthy list of Vehicle Identity Numbers. He says the cars in the list use punctured, dented or damaged battery modules. In Tesla's lawsuit against the former employee, it said he admitted that he created software to hack Tesla's manufacturing OS and that he sent large amounts of data to parties outside of the company. Tripp is now denying that accusation, claiming that he "can code about as well as a 3 year old." He also says that he was interrogated for two days and that two of his interrogators came to Tesla from Uber. 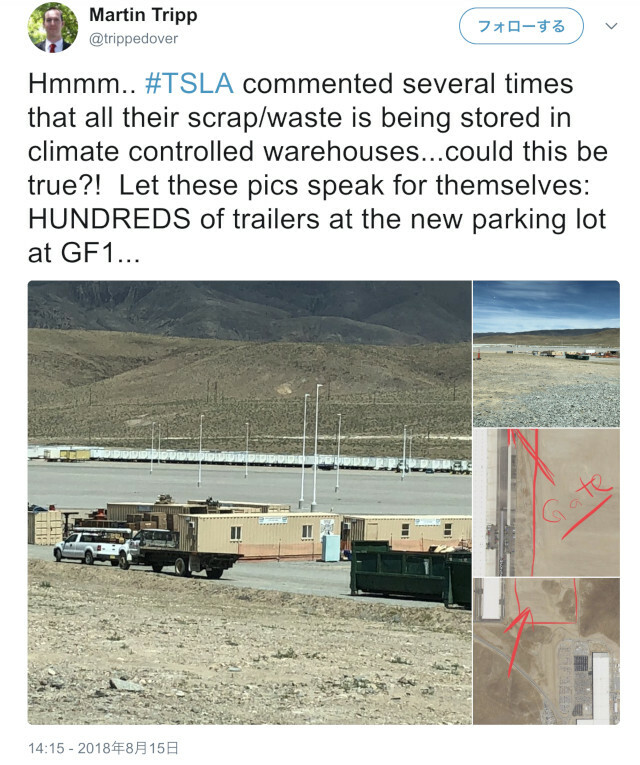 After Tesla sued Tripp, the company had to tighten its security at the Gigafactory following a report that the former employee was planning to shoot up the place. The automaker also served Facebook and Dropbox with subpoenas in an effort to see what confidential data it believes the former employee leaked. Tripp responded to all those by filing a whistleblower complaint with the Securities and Exchange Commission, accusing Tesla of misleading investors and putting customers at risk. Update: It appears Twitter has suspended Tripp's access to the social network, but you can still see all his tweets. *Update 2: Corrected the post to say the pictures show a damaged battery module, since there's no visible puncture. Thanks, Jason! Update 3 (08/17/18 5AM ET): Twitter has pulled Martin Tripp's account.